Kia recently held the media launch for it’s 3rd generation mid-sized CUV, the 2016 Kia Sorento. The media drive was held at Mt Tremblant, Quebec. Not the usual warmer mid-winter programlocation such as Austin, Texas or Southern California (places you can usually count on for pleasant driving conditions). Kia figured what better place to showcase the vehicle’s capabilities than in an environment that most Canadians would likely experience during their ownership experience with the Kia Sorento. Back in 2003 I was on the Kia Sorento’s maiden press launch. At that time a good portion of the presentation was spent taking about the truck-like ruggedness with its body on ladder box frame construction. Then, the term SUV became taboo and the second generation model was switched to a uni-body platform. The Sorento is now marketed as a Crossover SUV. Who can argue with that approach when the Sorento is currently Kia’s second most popular model in Canada? The all-new exterior styling is the latest effort by Peter Schreyer (“the father of the design led revolution”). The design succeeds in carrying over the familial styling DNA. Most noticeable is the front grille which now exhibits the Tiger Nose stying cue found on other Kia models. The rest of the sheet metal is a crisp and has an understandably Euro-centric feel. The overall design seems modern without being trendy and thus easily aged. The new Kia Sorento is longer, lower and wider than the previous model. The revised shape adds to the esthetic but also yields extra room within the cabin. Kia has chosen to offer both 5 and 7 passenger versions of the Sorento. Seating in the first two rows of either vehicle is identical regardless of choice. On 7 passenger models, Kia claims the additional room allows for better access to the 3rd row of seating. Getting into backseat seemed easy enough for my 6ft frame. Once in, the seat bottoms in the third row are essentially flat on the cabin floor so your knees are up in the air. However there is ample legroom behind the second row of seats. Getting out of the back row requires a leap or step of faith. In essence you end up slithering out through the gap left by forward sliding middle seats. I think kids will find it fun. I am not sure adults would sit back there for any prolonged periods or try to repeat the exit maneuver once they’ve given it a try. Looking around the Sorento cabin, first rate materials have been used everywhere. The dash is an elegant and restrained layout faced in soft synthetics. The instrument panel is practically laid out with easy to identify gauges and warning lights. Seating starts with a standard woven cloth and varying degrees of leather are available, up through the various trim levels, culminating with Napa leather in top trim models. The seats themselves proved supportive and comfortable, regardless of how much you wanted to spend on covering them. Depending on the model chosen, either a 4 inch or 7 inch LCD infotainment screen sits in the center of the dashboard. The 7 inch model, that includes the onboard NAV system was truly impressive in resolution and ease of use. 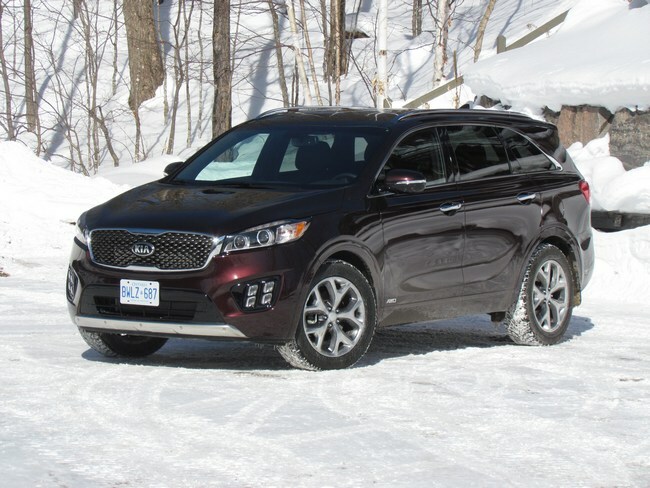 The 2016 Kia Sorento will be offered in Canada with 3 powertrains. The base offering is a 2.4L direct injected four cylinder with electronic variable valve timing produces 185 horsepower and 178 lb-ft of torque. 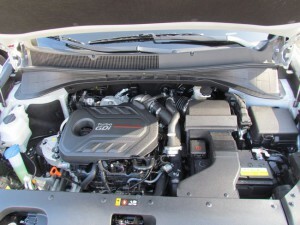 New to Sorento will be the 2.0L turbo-charged four cylinder engine used in the Optima. However, in this application the engine will produce 240HP and 260 lb-ft of torque. Also noted was that the engine now produces its torque maximum at an incredible useful 1450 RPM. 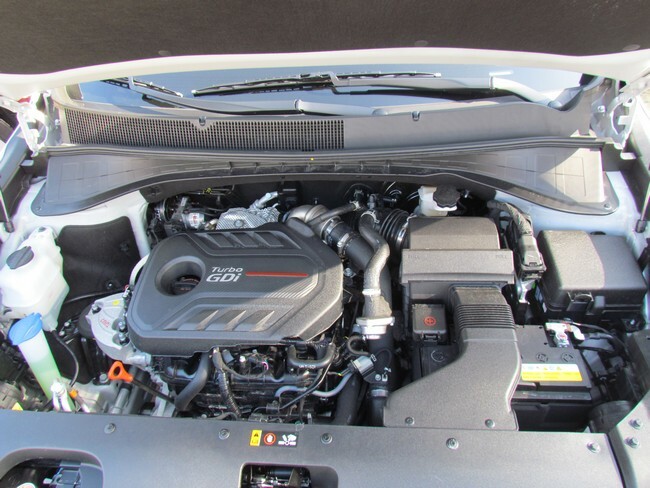 The top level power plant is the venerable 3.3L V6 that remains unchanged from last year’s model. It produces 290HP and 252 lb-ft. All three engines are offered with a six speed automatic transmission. I can already hear the groans about why no 8 or 9 speed transmission. Kia explained these transmissions are best suited for a truck application and have proven themselves reliable in previous applications. On the road, regardless of engine choice, drivers will notice a more rigid and quiet vehicle. Kia has refined the Sorento’s structure by increasing the use of Ultra High Strength Steel (UHSS) in the design. Instead of 24% use of UHSS in the last model, the new Sorento has over 50% UHSS throughout the vehicle. Also added are thicker laminate material in the front windshield and insulated side glass on higher end models. The door sills have been covered with longer door skins, effectively shielding the door seals from wind or water penetration. The drier door sills also mean fewer stained trousers getting in and out of the vehicle. In addition to the more rigid body, a change in the design of the rear suspension has improved ride quality. The shock absorbers are now oriented straight up and down instead of at a 45 degree angle in the previous model. Over the snow covered, often unpaved roads around Mt. Tembant, the Sorento was a pleasant vehicle to drive. Test vehicles were equipped with either the 2.0L turbo or V6 engines. The base unit was notably absent. Either engine imparted a different experience for the driver. The smaller,boosted engine gave a more pronounced kick in acceleration, while the V6 , as one would expect, was more fluid in applying power. Strangely, I found the turbo engine quieter with a somewhat hollow sounding note. The V6 did have a more muscular sound, which it readily shared with its occupants. Kia has tried to make the Sorento a segment filler and something of a Jack of all trades. With varying layouts and engine choices, there are a myriad of models to choose from when shopping for a Sorento. The entry level LX models comes as a 5 passenger model, in front wheel drive,with the 2.4L engine, priced at $27,495. You can order all-wheel-drive as a $2,000 option. If you wanted the 2.0L Turbo you’ll need to step up to LX+ trim, starting at $30,695. All-wheel-drive is again a $2000 option. This type of stepping continues up to the SX+, which can only be bought as an all-wheel-drive, 7 passenger model and tops out at $46,695. In between, the trading back and forth continues, however, you can only get 7 passenger seating paired with a V6 engine. As is usual with any multi-level model, the sweet spot sits in the middle of the range. The 5 passenger Sorento LX+ is equipped with the 2.0L turbo and with the optional all-wheel-drive, standard UVO voice activated infotainment system and backup camera. This trim level offers the most vehicle for the money, at a price of $34,694. This will likely be the volume leader of Sorento line. The latest Sorento represents a significant refinement over the the previous model which seemed to resonate favorably with buyers. The future looks bright for this latest Kia Sorento. Look for the 2016 Kia Sorento in dealer showrooms later this year.